Welcome to the Chair for Molecular Functional Materials. This is a professorship in the context of the cluster of excellence cfaed – “Center for Advancing Electronics Dresden”. 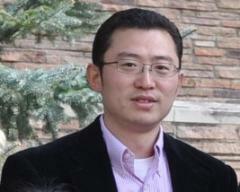 It is headed by Prof. Xinliang Feng. Exploring earth-abundant, active and stable electrocatalysts to replace noble metal catalysts for oxygen evolution reaction (OER) through alkaline water photoelectrolysis and electrolysis system is a key to develop sustainable energy conversion technologies. 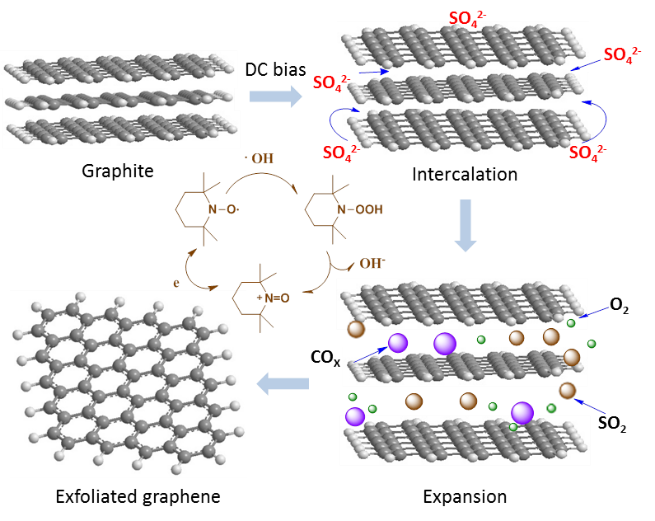 Despite certain progress made in the development of heteroatom-doped carbon materials in the past, especially the transitional metal-N (TM–Nx) doped nanocarbons catalysts, the application of TM–Nx-doped nanocarbons in OER electrocatalysis is in infancy, and the overall catalytic performance of TM–Nx-doped nanocarbons is far from satisfactory for practical applications. Here, Prof. Dr. Xinliang Feng (Technische Universität Dresden, Germany), Prof. Dr. Yang Hou (Zhejiang University, China), and colleagues report a 2D nanocarbon hybrid electrocatalyst comprised of atomically dispersed Ni atoms coordinated with three nitrogen and one sulfur atoms in porous carbon nanosheets (S|NiNx-PC). 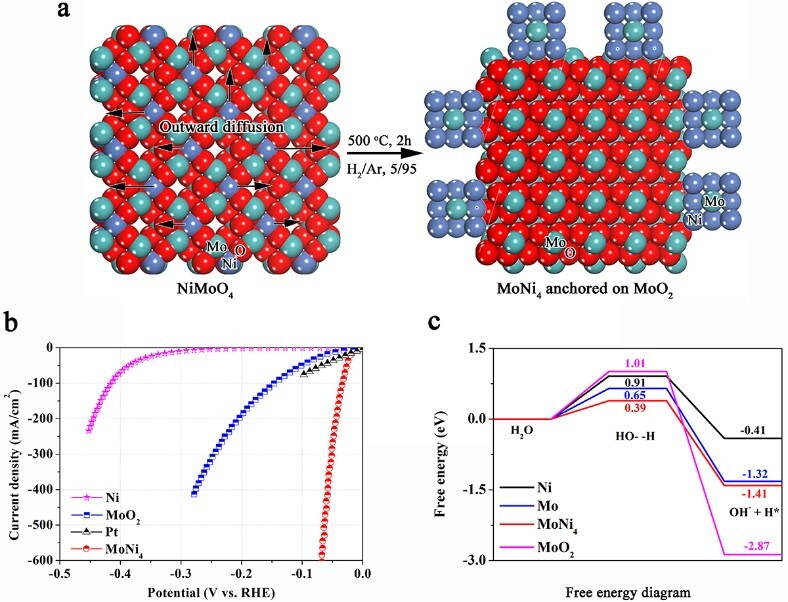 Benefiting from the abundant porous architecture and well-distributed active sites, the achieved S|NiNx-PC/EG nanosheets electrode displays outstanding electrocatalytic activity and durability for OER with a low overpotential of 1.51 V at 10 mA cm-2 and a small Tafel slope of 45 mV dec-1 in alkaline media. The overpotential for the S|NiNx-PC/EG is the lowest among all heteroatom- and/or transition metal-doped carbon electrocatalysts for OER reported thus far, and it even surpasses the state-of-the-art commercial Ir/C catalyst. Moreover, an integrated photoanode of nanocarbon on a Fe2O3 nanosheet array enables highly active solar-driven oxygen production. Experimental results reveal that the well-dispersed molecular S|NiNx species act as active sites for catalyzing OER, where the incorporated S atoms can effectively tune the hybridization state of the Ni and N atoms and enhance the electron transfer, thus synergistically promoting the oxidation kinetics. Theoretical calculations manifest that the coordination of Ni–Nx centers hybridized with that of neighboring S atom creates sufficient localized reactive sites by modifying the local charge distribution on the carbon surface and reducing the potential barriers of the elementary reactions, thereby boosting its OER kinetics. More importantly, the accurate atomic structure of isolated Ni atoms coordinated with three N atoms and one S atom in the carbon matrix for the S|NiNx active centers is clearly disclosed by aberration-corrected scanning transmission electron microscopy, atomic electron energy loss spectroscopy and synchrotron radiation X-ray absorption spectroscopy together with DFT-simulated scanning tunneling microscopy. This work was published at Nat. Commun. 2019, doi: 10.1038/s41467-019-09394-5. Dr. Lucia Gemma Delogu has received a call for professor in Biochemistry with tenure track at the Department of Biomedical Sciences at the University of Padua Italy. 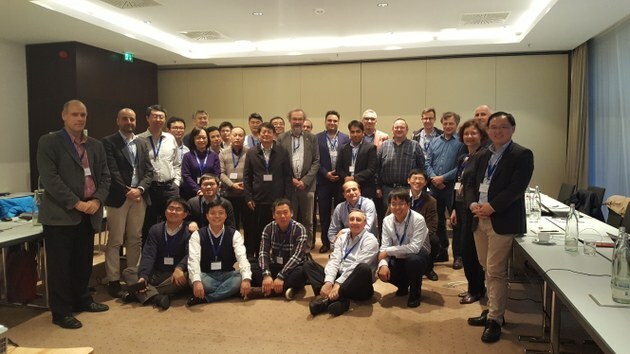 The 2nd Graphene Flagship EU-China Workshop on Graphene and related 2D materials was held on 07-08 December 2018 at Pullman Hotel in Dresden organized by Graphene Flagship and Chair of Molecular Functional Materials (Prof. Xinliang Feng). During the workshop speakers from China and European countries presented their current works and exchanged their experiences and ideas related to the current and emerging topics associated with the fundamental materials synthesis, physics and devices for graphene and related 2D materials. At the end of the workshop, Chinese and European speakers have built new collaborations base on the presented works in the workshop. The Humboldt Research Fellowship is awarded to researchers from abroad with above average qualifications and who are at the beginning of their career. 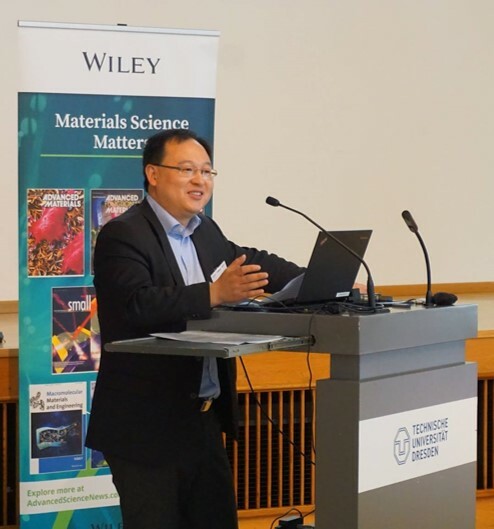 By being granted this fellowship, Dr. Zhen Zhang, will receive financial support for two years to carry out his research in the research group of Prof. Xinliang Feng at Technische Universität Dresden. Prof. Dr. Xinliang Feng has been listed as highly cited researcher in 2018 for his research performance demonstrated by the production of multiple highly cited papers that rank in the top 1% by citations for field and year in Web of Science. MXenes are a fascinating class of two-dimensional (2D) materials that consist of few atoms thick layers of transition metal carbides, nitrides or carbonitrides. They have aroused increasing attention due to their unique combination of hydrophilic properties and good electrical conductivity. The production of MXene relies on chemical etching of aluminium (Al) layers from titanium aluminium carbide (Ti3AlC2, a MAX phase). Although diverse etching conditions have been identified, the state-of-the-art strategies require the handling of hydrofluoric acid or fluoride-based compounds, which result in highly toxic and corrosive liquid waste, and the functionalization of Ti3C2 surfaces with fluorine- and oxygen-containing terminations. Along with the considerable safety issues, fluoridated etchants have negative impact on the specific capacitance of etched materials when used as electrodes for supercapacitors. 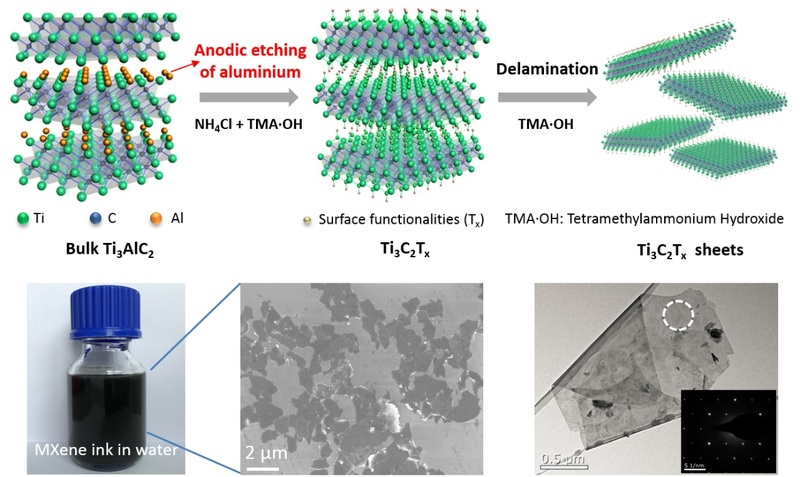 To address these problems, researchers from Technical University of Dresden (Chair for Molecular Functional Materials) and collaborators have developed an efficient electrochemical strategy to prepare Ti3C2Tx (T=O, OH) (MXene) in a binary aqueous system. The anodic etching of Al atoms followed by the replacement with hydroxide groups enable the formation of single or bilayer sheets with high yield (>90 %) and large average dimension. The results are comparable or even better than those made from classic etching techniques using HF or LiF/HCl. For the use as energy storage materials, all-solid-state supercapacitors assembled with Ti3C2Tx films deliver a high areal capacitance of 220 mF cm-2 (scan rate: 10 mV s-1). More importantly, this method does not require any dangerous fluoride-containing agents or harsh etching conditions, therefore it is appealing for the practical production of novel MXene materials. This work was financially supported by the Deutsche Forschungsgemeinschaft (MX-OSMOPED project), ERC grants on 2DMATER, Graphene Core 2 and EC under Graphene Flagship (NO. CNECT-ICT-604391) and Center for Advancing Electronics Dresden (cfaed). 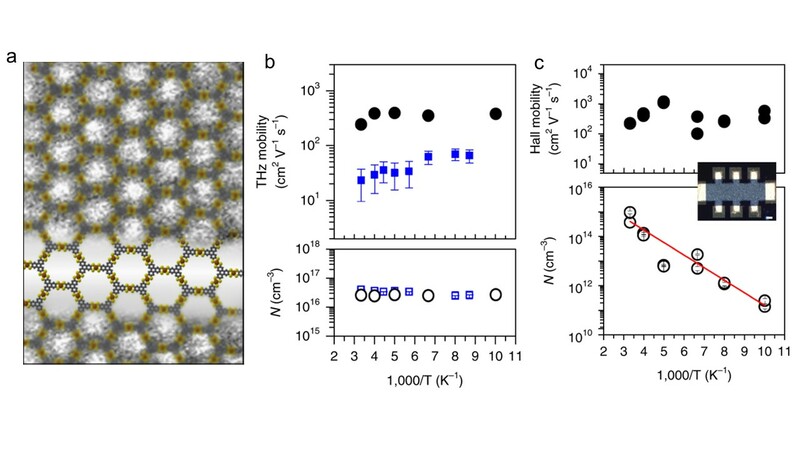 A group of scientists has observed for the first time band-like electron transport in a conjugated two-dimensional (2D) metal-organic framework film (Nature Materials, "High-mobility band-like charge transport in a semiconducting two-dimensional metal–organic framework"). This semiconducting behavior, together with its cost-effective production, opens the path for employing metal-organic frameworks as electroactive materials in electronic devices. The 21st century has seen a reinvention of how modern electronics impact our daily lives. Inorganic semiconductors as silicon, germanium or gallium arsenide are at the core of modern electronics; they are currently widely employed in e.g. computer chips, LEDs and solar cells. Inorganic semiconductors are highly pure, crystalline and hence ordered materials, these features make them good conductors of electricity under the application of an external bias (e.g. by applying a voltage). As a drawback, their high crystallinity and purity is reached by high temperature processing and then, they are very expensive to produce. A low-cost alternative are organic based semiconductors as e.g. polymers, these can be processed at room temperatures. The scientists from TU Dresden/MPI-P/IMDEA Nanociencia/HZDR/MPI-CPS/Sofia have now developed and characterized a novel metal-organic framework (MOF) material, an organic graphene-like two-dimensional (2D) material made at room temperature that, remarkably, behaves electrically as inorganic semiconductors. These results open the path for exploiting MOFs as electroactive materials in electronic devices. Figure (a) A high-resolution transmission electron microscopy image of the conjugated 2D MOF together with the structural schematic (grey, yellow and orange: carbon, sulfur and iron atoms, respectively). (b and c) Transport studies by THz spectroscopy and Hall effect measurements, respectively. MOFs are crystalline coordination polymers that consist of metal ions connected by organic ligands. In the past, MOFs were regarded as insulators due to the large separation of metal centers by multi-atom, insulating organic ligands, etc. The new conjugated 2D MOF, produced by the team of Dr. Renhao Dong and Prof. Xinliang Feng in TU Dresden, is a highly crystalline film, obtained from trigonal planar organic ligands that are coordinated by square-planar atomic metal nodes. Such design rendering graphene-like conjugated planar geometry induces full delocalization of p-electrons in 2D, leading to a largely improved conductivity and a narrowed band gap. The group led by Dr. Enrique Cánovas in MPI-P/IMDEA Nanociencia characterized the 2D MOFs by Terahertz (THz) spectroscopy, a tool that measure the conductivity of a sample in ultrafast time scales (10-12 seconds), locally (measuring currents over distances as short as 10-9 meters) and optically (without the need of applying perturbative metal contacts). These aspects enabled THz spectroscopy to assess the dependence with frequency for the conductivity in the 2D MOF, which turns out to obey a “Drude” behaviour; the same found in e.g. in highly crystalline silicon. From the Drude response, resolved by THz spectroscopy in the novel 2D MOFs, a world record electron mobility was inferred, that surpass previous values, obtained in insulating MOFs, by a factor of 10000. The “Drude” behaviour implies that electrons can be displaced very easily over very long distances when a voltage is applied. As contrast, a Hall effect measurement by the group led by Dr. Artur Erbe in HZDR based on a “real” electronic device further confirmed the high mobility in this novel MOF. These results open the path for exploiting low cost MOFs in a plethora of novel applications where long-range motion of electrons is desired (e.g. in electronic devices). This research is a joint collaboration between scientists from Germany, Bulgaria and Spain. 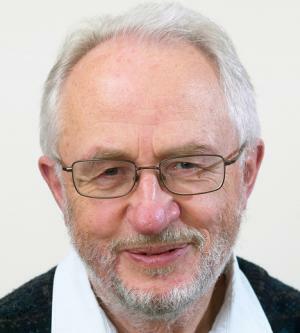 The Technical University of Dresden, the Max Planck Institute for Polymer Research, the Max Planck Institute for Chemical Physics of Solids, the Helmholtz Zentrum in Dresden, the Wilhem-Ostwald-Institute of Physical and Theoretical Chemistry in Leipzig, The University of Sofia and the Madrid’s Institute of Advanced Studies IMDEA Nanociencia contributed to this work. Renhao Dong, Peng Han, Himani Arora, Marco Ballabio, Melike Karakus, Zhe Zhang, Chandra Shekhar, Peter Adler, Petko St. Petkov, Artur Erbe, Stefan C. B. Mannsfeld, Claudia Felser, Thomas Heine, Mischa Bonn, Xinliang Feng and Enrique Cánovas. High-mobility band-like charge transport in a semiconducting two-dimensional metal–organic framework. Nature Materials 2018, online. This work was financially supported by the ERC Grant on 2DMATER, HIPER-G and EU Graphene Flagship, European Science Foundation (ESF), SPP 1928 (COORNET) and the German Science Council. Financial support by the Max Planck Society is also acknowledged. We acknowledge the CFAED (Center for Advancing Electronics Dresden). E.C. acknowledges financial support from the Max Planck Graduate Center and the Regional Government of Comunidad de Madrid under project 2017-T1/AMB-5207. R.D. gratefully appreciates funding from the Alexander von Humboldt-Foundation. H.A. and A.E. are grateful to the Initiative and Networking Fund of the Helmholtz Association of German Research Centers through the International Helmholtz Research School for Nanoelectronic Networks, IHRS NANONET (VH-KO-606). We appreciate LPKF Laser & Electronics for the fabrication of the Hall bar geometry by laser ablation. We acknowledge the Dresden Center for Nanoanalysis (DCN) at TUD and P. Formanek (Leibniz Institute for Polymer Research, IPF, Dresden) for the use of facilities, and we appreciate X. Zhang, T. Zhang, F. Ortmann and K. S. Schellhammer for the helpful discussion. P.P. and T.H. thank ZIH Dresden for providing high-performance computing facilities. 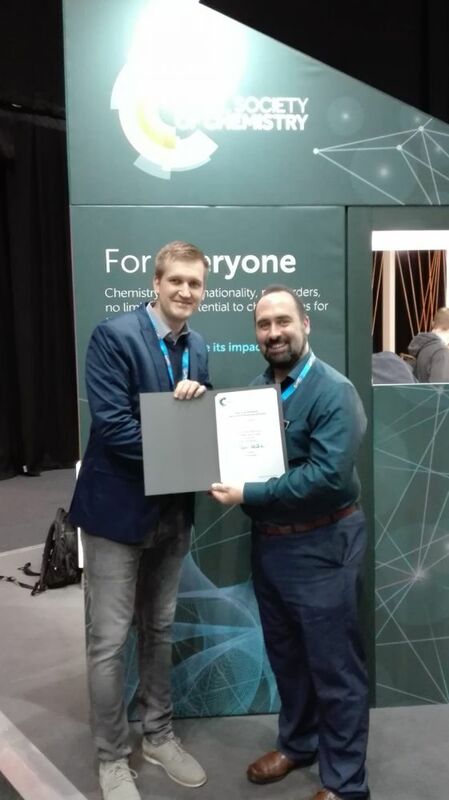 Congratulations to our PhD student Marcus Richter for the honour to win the Royal Science Chemistry (RSC) poster prize at the EuCheMS conference 2018, which was sponsored by the three RSC journals Nanoscale, Nanoscale Advances and Nanoscale Horizons. The 7th EuChemS Congress is an internationally respected, large-scale event for chemical sciences, which was held from 26th to 30th August 2018 in Liverpool. 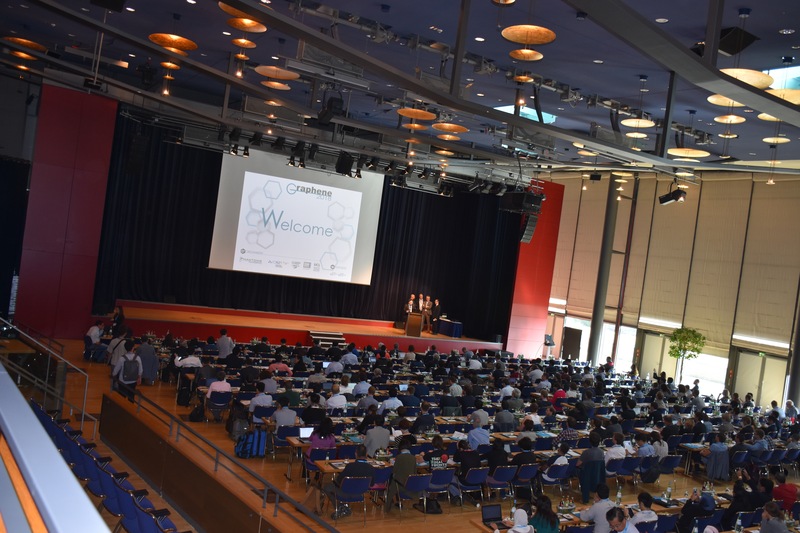 This conference had a wide selection of current research topics in chemistry and was highlighted by expert talks from noble prize winner Ben Feringa, Michael Grätzel or Omar Yaghi. Exactly 30 years ago, Advanced Materials - the scientific journal focusing on innovative materials research - saw the light of day. 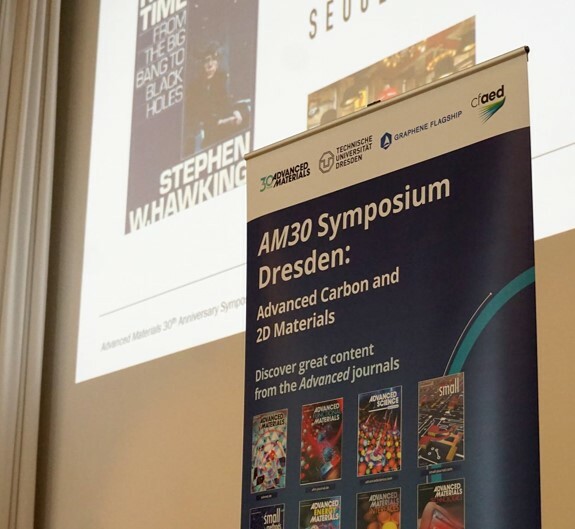 On this occasion the TU Dresden was proud to organize a scientific symposium with the topic "Advanced Carbon & 2D Materials" in honour of this first-class journal which is pioneering in the field of chemistry and materials research. 24 world-renowned scientists from all over the world gave an insight into their groundbreaking research in these fields. A large number of young scientists followed the inspiring lectures and had the opportunity to present their latest research results to the experts in these research fields, but also to high-ranking representatives of the journal and the publishing house Wiley-VCH, resulting in a stimulating scientific exchange. 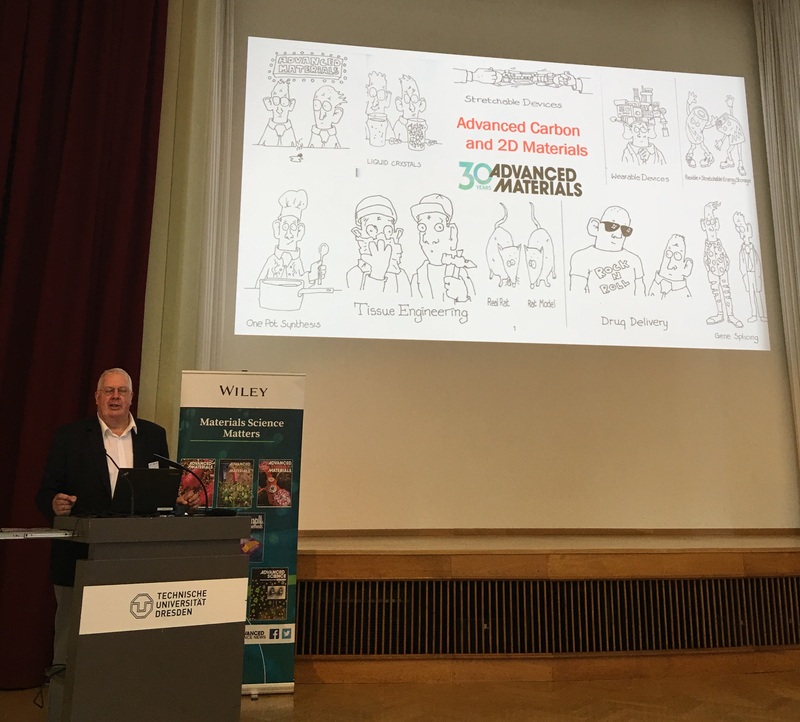 It can be said that this symposium was a complete success due to its internationality, the diversity of research and the numerous discussions - both for "Advanced Materials" and Wiley-VCH, the participating (young) scientists and the materials research location TU Dresden. Metal-organic frameworks (MOFs) so far have been highlighted for their potential roles in catalysis, gas storage and separation. However, the realization of high electrical conductivity (>10-3 S/cm) and magnetic ordering in MOFs will afford them new functions for spintronics, which remains relatively unexplored. The groups from cfaed/TUD/HZDR/MPICPS/IKTS/XJTU demonstrate the synthesis of a two-dimensional MOF (2D MOF) by solvothermal methods using perthiolated coronene, namely 1,2,3,4,5,6,7,8,9,10,11,12-perthiolated coronene (PTC, reported by the same group (J. Am. Chem. Soc., 2017, 139, 2168-2171)), as a ligand and planar iron-bis(dithiolene) as linkages enabling a full p-d conjugation. 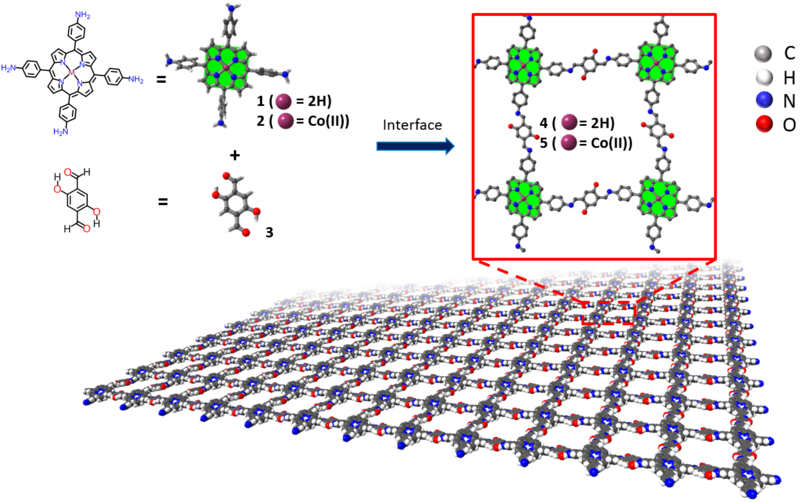 Thus, such 2D MOF is featured with hexagonal lattices and van der Waals layer-stacking structure. Van der Pauw electrical measurement reveals the room temperature conductivity value of ~10 S/cm for bulk compressed pallet. A variable-temperature conductivity measurement displays a non-linear increase of conductivity with temperature, indicating a typical semiconducting behavior. A density functional theory (DFT) calculation is carried out to estimate the band gap as ~0.2 eV for a monolayer MOF. A variable-temperature magnetic susceptibility measurement as well as 57Fe Mössbauer spectra demonstrated that the PTC-Fe exhibit ferromagnetic ordering within nanoscale magnetic clusters at low temperatures (below ~20 K), thus evidencing exchange interactions between the intermediate spin iron(III) centers via the delocalized p electrons. Our work highlights conjugated 2D MOFs as a class of conductive materials exhibiting ferromagnetic and semiconducting features for potential spintronics application. This work was financially supported by the ERC Grant on 2DMATER, EU Graphene Flagship, SPP 1928 (COORNET) and the German Science Council. We acknowledge the cfaed (Center for Advancing Electronics Dresden). We also thank Beamline BL14W1 at the Shanghai Synchrotron Radiation Facility (SSRF) for providing the beamtimes to carry out the XAS measurements. 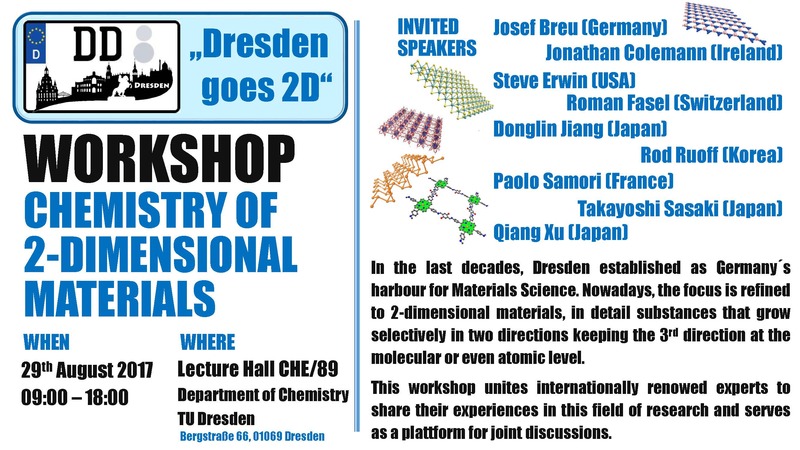 We acknowledge Dresden Center for Nanoanalysis (DCN) at TUD and Dr. Petr Formanek (Leibniz Institute for Polymer Research, IPF, Dresden) for the use of facilities, and we like to appreciate Prof. Stuart Parkin, Dr. Binghai Yan, Dr. Reinhard Berger and Mr. Chi Xu for the helpful discussion. Renhao Dong, Zhitao Zhang, Diana C. Tranca, Shengqiang Zhou, Mingchao Wang, Peter Adler, Zhongquan Liao, Feng Liu, Yan Sun, Wujun Shi, Zhe Zhang, Ehrenfried Zschech, Stefan C.B. Mannsfeld, Claudia Felser & Xinliang Feng*, A coronene-based semiconducting two-dimensional metal-organic framework with ferromagnetic behavior. Nat. Commun. 2018, DOI: 10.1038/s41467-018-05141-4. 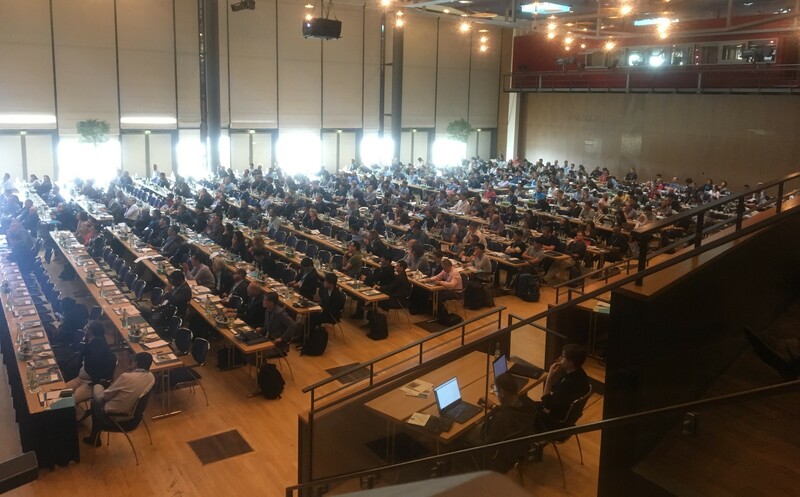 The 8th edition of International Graphene Conference series, the largest European Event in Graphene and 2D Materials with nearly 650 participants from different scientific institutes and industries was successfully held in Dresden from the 26th to 29th of June 2018. The conference covered all areas related to Graphene and 2D Materials including chemistry, physics, material science and engineering. Moreover, within Exhibition and 2 days INDUSTRIAL FORUM, most recent technologies and business opportunities in Graphene and 2D Materials commercialization were presented. 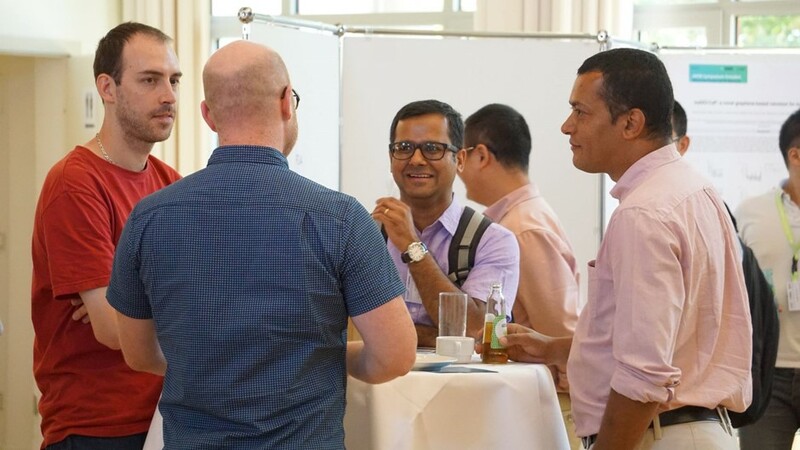 On June 25th a meeting of the EU Graphene Flagship with 27 participants from different European institutes and companies took place at TU Dresden. The chair for molecular functional materials (Prof. Xinliang Feng) is the leader of working package 13 (Functional Foams and Coatings) of this EU Flagship project and the purpose of this meeting was to discuss initial results and future perspectives in the field of graphene and related 2D material. The special focus of this meeting was the use of graphene and 2D materials in coatings and porous structures like foams and membranes for applications such as energy storage and conversion, catalysis, water filtration and environmental protection. 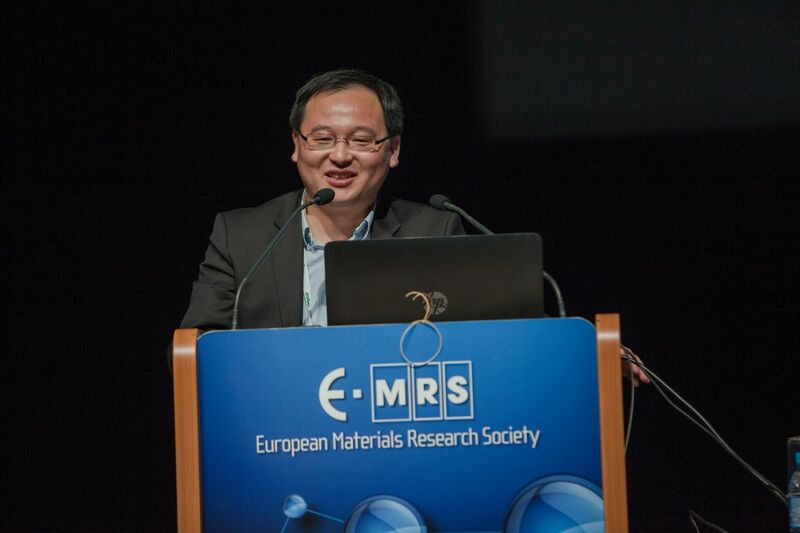 Prof. Xinliang Feng, cfaed Chair for Molecular Functional Materials, has been announced as the winner of the 2018 edition of the EU-40 Materials Prize for his outstanding and innovative contributions to Materials Research in Europe. The EU-40 Materials Prize is awarded to researchers under 40 who have a major impact in the field and show exceptional promise for leadership. This prestigious award consists of a 5,000 Euro cash prize, a certificate, waiver of the meeting registration fee and a plenary talk at the Spring Meeting of the European Materials Research Society where the award was presented. The award ceremony took place on June 20, 2018 in Strasbourg, France. Story of peri-acene (n-PA) molecules started one century ago. Apart from perylene (R. Scholl, 1910) and bisanthene (E. Clar, 1948), all n-PAs are theoretically predicted to show singlet biradical ground state (open-shell), and, hence unstable under ambient conditions. After several decades of waiting, recently, researchers from Technische Universität Dresden (Chair for Molecular Functional Materials, cfaed) and collaborators tackle the synthetic challenges to realize peri-tetracene (4-PA), the next higher analogue, in solution via steric-protection of its active zigzag edges. This work has been published in Journal of the American Chemical Society (J. Am. Chem. Soc., 2018, DOI: 10.1021/jacs.8b03711). The authors demonstrated the synthesis and characterization of the hitherto unknown 4-PA by a rational bottom-up strategy. The phenyl substituents at the zigzag periphery of 4-PA not only offer stability, but also enhance its solubility in common organic solvents. The obtained 4-PA possesses a singlet biradical character (y0 = 72%) and exhibits remarkable persistent stability with a half-life time (t1/2) of ∼3 h under ambient conditions. UV–vis–NIR and electrochemical measurements reveal a narrow optical/electrochemical energy gap (1.11 eV) for 4-PA. Moreover, the bay regions of 4-PA enable the efficient 2-fold Diels–Alder reaction, yielding a novel full zigzag-edged circumanthracene (CA). This work was financially supported by ERC grants on 2DMATER, the European Union’s Horizon 2020 research and innovation programme under grant agreement No 696656 (Graphene Flagship Core1), Center for Advancing Electronics Dresden (cfaed), European Social Fund and the Federal State of Saxony (ESF-Project “GRAPHD”, TU Dresden). 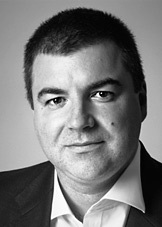 J.J.W. thanks the DFG for funding a Rigaku Oxford Diffraction SuperNova system with a dual source (INST 269/618-1). The authors acknowledge the use of computational facilities at the Center for information services and high performance computing at TU Dresden. M. R. Ajayakumar, Y. Fu, J. Ma, F. Hennersdorf, H. Komber, J. J. Weigand, A. Alfonsov, A. A. Popov, R. Berger, J. Liu, K. Müllen, X. Feng, J. Am. Chem. Soc., 2018, DOI: 10.1021/jacs.8b03711). As conventional Li-ion batteries are approaching the bottleneck of energy and power limit, new energy storage technologies with fast-charging feature but based on low-cost materials are highly desirable for future sustainable and scalable applications. To construct next-generation quick-charge batteries, the key lies at developing high power cathodes. However, conventional strategies heavily relied on nanoengineering approaches sacrificing the scalability and battery cost. The group from cfaed/ Technische Universität Dresden provides another option to build high power cathodes, where inexpensive graphite powders were exploited as the active cathode material. The disintegration problem of graphite cathode, that suffers from large volume change (>130%) during anion (de)intercalation, was well suppressed by utilizing a strong aqueous binder, alginate sodium. Then the mechanically stable electrode functioned as a reliable platform to investigate the electrochemical performance of graphite cathode and reaction kinetics of anion intercalation process. Ultrahigh power density of 42.9 kW/kg at the energy density of 334 Wh/kg and long cycling life (>10000 cycles) were achieved on commercial bulk graphite, surpassing conventional cathodes for Li-ion batteries. The kinetics analysis further revealed that, for the first time, anion intercalation into graphite is a self-activating and fast (pseudo)capacitive process. The kinetical differences between anion intercalation and cation intercalation into graphitic carbon materials were also identified in the paper. Title: Self-activating, capacitive anion intercalation enables high-power graphite cathodes. Adv. Mater., 2018, 1800533. Researches from the Chair for Molecular Functional Materials of Prof. Xinliang Feng, and other research groups in Germany, China and Italy have recently published a paper in Nature Communications on 19th March 2018, titled “Copper-surface-mediated synthesis of acetylenic carbon-rich nanofibers for active metal-free photocathodes”. This work reported a facile and scalable approach for the synthesis of acetylenic carbon-rich nanofibers (i.e. polytriethynylbenzene, PTEB) via Cu-surface mediated Glaser polycondensation. The as-prepared PTEB nanofibers on conductive substrates can be directly utilized as metal-free photocathodes in photoelectrochemical cells (PECs) for hydrogen production, and the photocurrent can be increased through the introduction of thienothiophene segment into the PTEB nanofibers. This work highlights the promise of utilizing acetylenic carbon-rich materials as efficient and sustainable photocathodes for hydrogen production. 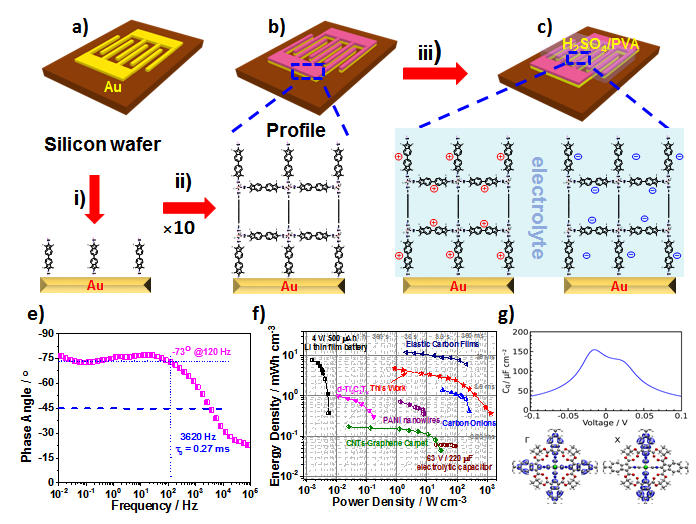 This work was financially supported by the ERC Grant 2DMATER, ESF Young Researcher Group ‘GRAPHD,’ and the EC under the Graphene Flagship (number CNECTICT-604391). The German Excellence Initiative via the Cluster of Excellence EXC1056 “Center for Advancing Electronics Dresden” (cfaed) is gratefully acknowledged. Extraordinary electronic and photonic features render black phosphorus (BP) an important material for the development of novel electronics and optoelectronics. Despite recent progress in the preparation of thinly layered BP flakes, scalable synthesis of large-size, defect-free BP flakes remains a major challenge. An electrochemical delamination strategy is demonstrated that involves intercalation of diverse cations in non-aqueous electrolytes, thereby peeling off bulk BP crystals into defect-free flakes comprising only a few layers. The interplay between tetra-n-butylammonium cations and bisulfate anions promotes a high exfoliation yield up to 78 % and large BP flakes up to 20.6 µm. Bottom-gate and bottom-contact field-effect transistors, comprising single BP flakes only a few layers thick, exhibit a high hole mobility of 252±18 cm2V-1s-1 and a remarkable on/off ratio of (1.2±0.15)×105 at 143 K under vacuum, comparable with the electronic properties of mechanically exfoliated BP flakes. This efficient and scalable delamination method opens new opportunities for the development of BP-based composites and optoelectronic devices. The related work has published in Angew. Chem. Int. Ed. This work is financially supported by ERC grants on 2DMATER, Graphene Core 1 and EC under Graphene Flagship (NO. CNECT-ICT-604391) and Center for Advancing Electronics Dresden (cfaed). Prof. Xinliang Feng is one of the co-organizers of the Graphene 2018 conference which will take place in Dresden (Germany) from June 26 – June 29, 2018. 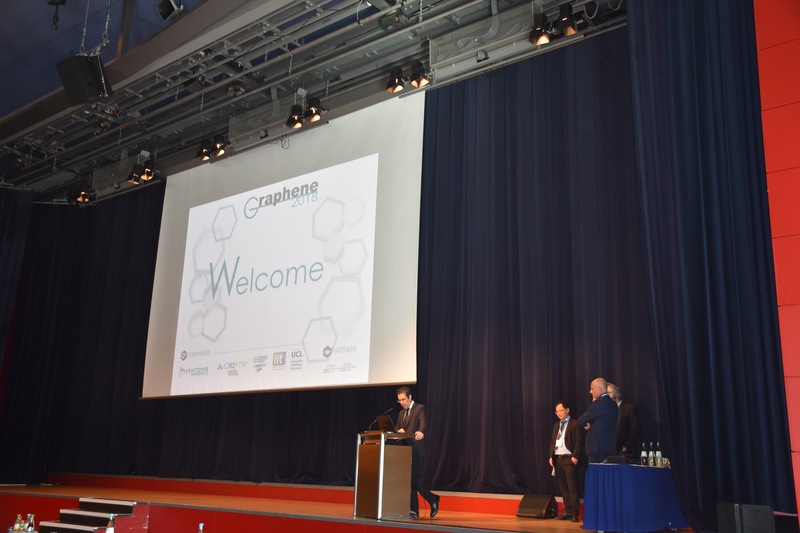 The 8th edition of Graphene Conference series is the largest European Event in Graphene and 2D Materials. Researches from the Chair for Molecular Functional Materials of Prof. Xinliang Feng at Dresden University of Technology, Max-Planck Institute for Polymer Research Mainz, Technical University of Munich and Linköping University, recently, explored an unprecedented way of doping Graphene by incorporating antiaromatic units in the basal plane. 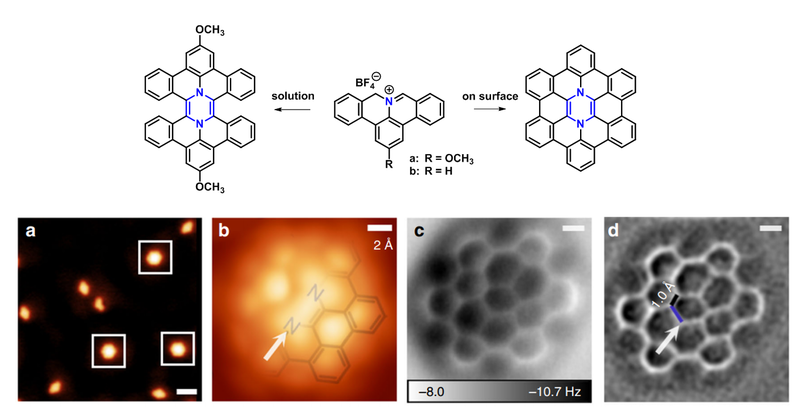 In the joint publication “Exploration of pyrazine-embedded antiaromatic polycyclic hydrocarbons generated by solution and on-surface azomethine ylide homocoupling” in Nature Communications, Xiao-Ye Wang, Marcus Richter, Yuanqin He, Jonas Björk, Alexander Riss et al. 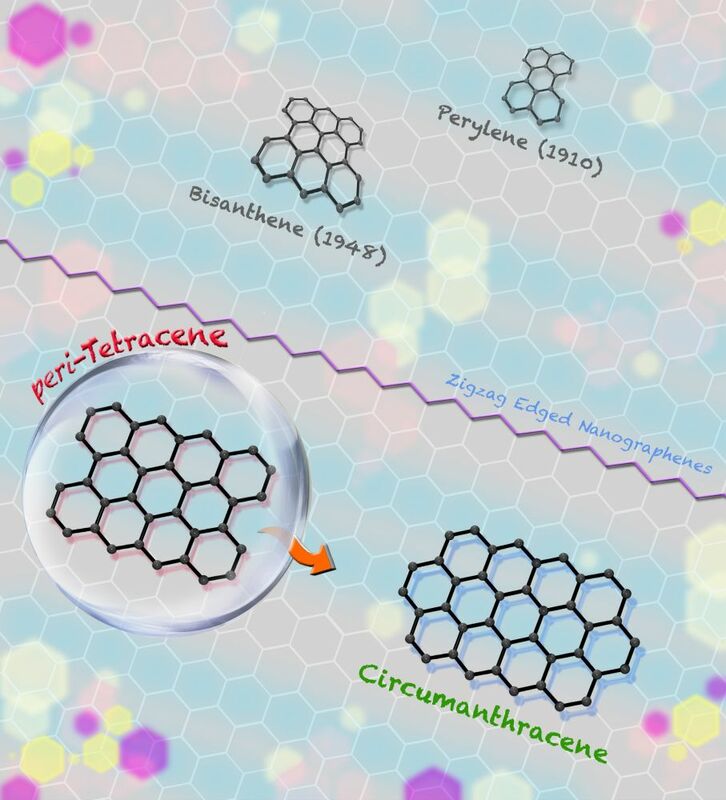 (all authors contributed equally) demonstrated azomethine ylide homocoupling as a strategy to synthesize non-planar polycyclic aromatic hydrocarbons in solution and planar nanographenes on surfaces, embeding a central pyrazine ring. The antiaromaticity of the central pyrazine ring is indicated by optical absorption spectroscopy in conjunction with theoretical calculations. 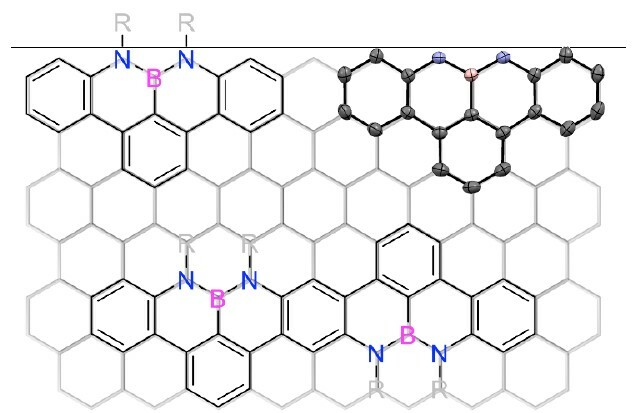 This strategy opens up methods for chemically tailoring graphene and nanographenes, modified by antiaromatic dopants. “Exploration of pyrazine-embedded antiaromatic polycyclic hydrocarbons generated by solution and on-surface azomethine ylide homocoupling”. Xiao-Ye Wang, Marcus Richter, Yuanqin He, Jonas Björk, Alexander Riss, Raju Rajesh, Manuela Garnica, Felix Hennersdorf, Jan J. Weigand, Akimitsu Narita, Reinhard Berger, Xinliang Feng, Willi Auwärter, Johannes V. Barth, Carlos-Andres Palma, Klaus Müllen, Nat. Commun., 2017, 8, 1948.
supported by the ERC Consolidator Grant NanoSurfs (no. 615233), the Max Planck Society, the German Excellence Initiative“Center for Advancing Electronics Dresden” (cfaed), and the Graphene Flagship. Congratulations to cfaed PhD student Marcus Richter for being honored with one of three prestigious ACS Nano Poster Prize Awards at the ChinaNANO 2017 in Beijing, which was held between August 29-31. He received it for his poster on “Polycyclic Azomethine Ylides as Versatile Building Block for Unprecedented N-doped Nanographenes”. A total of over 800 posters were pitching at the conference. 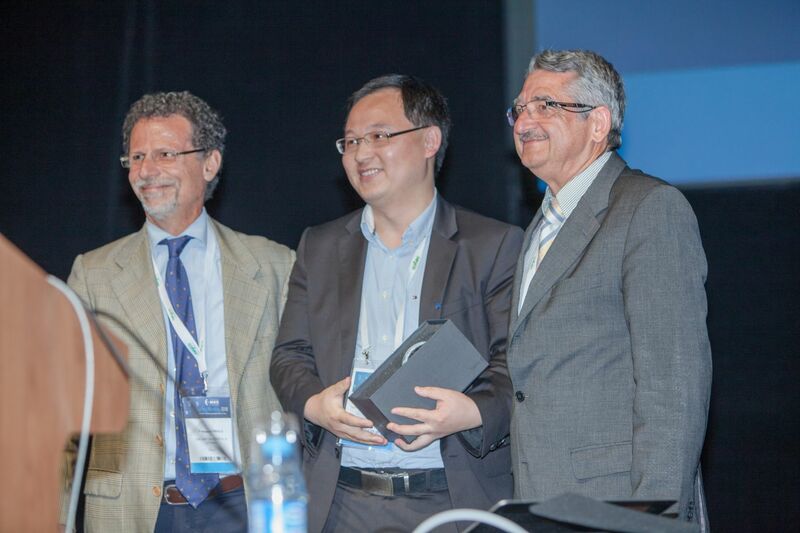 The prize was handed over by Prof. Paul S. Weiss (founding Editor-in-Chief of ACS Nano) during the closing session. Marcus Richter, who was supported by the cfaed Inspire Grant, visited the chairs of Prof. Carlos-Andres Palma, Prof. Shixuan Du and Prof. Hong-Jun Gao at the Institute of Physics at the Chinese Academy of Science in Beijing for two months. ChinaNANO 2017 is intended to stimulate discussions on the forefront of research in nanoscience and nanotechnology. The conference will focus on carbon nanomaterials, inorganic nanomaterials and MOFs, self-assembly and soft nanomaterials, nanocatalysis, nano-composites and applications, energy nanotechnology, environmental nanoscience and nanotechnology, nanophotonics and plasmonics, 2D materials beyond graphene and nanodevices, nanocharacterization, standards and metrology, modeling and simulation of nanostructures, nanobiotechnology and nanomedicine, nanotechnology for bioimaging and diagnostics, safety and health of nanomaterials，printing of nanomaterilas and applications as well as optoelectronic nanomaterials and devices. Prof. Xinliang Feng was one of the co-organizers of the successful 1st China-EU-Graphene Flagship Workshop on Graphene and 2D Materials. The workshop took place in Beijing, China at the Chinese Academy of Sciences (IOP, CAS) from June 29th - July 2nd, 2017. This workshop unites internationally renowed experts to share their experiences in this field of research and serves as a plattform for joint discussions. Carbon Materials such as nanoparticles, fibres, adamantane- and graphene-like structures are widely used in science and engineering. Applications range from energy and gas storage to electronics and optical applications. 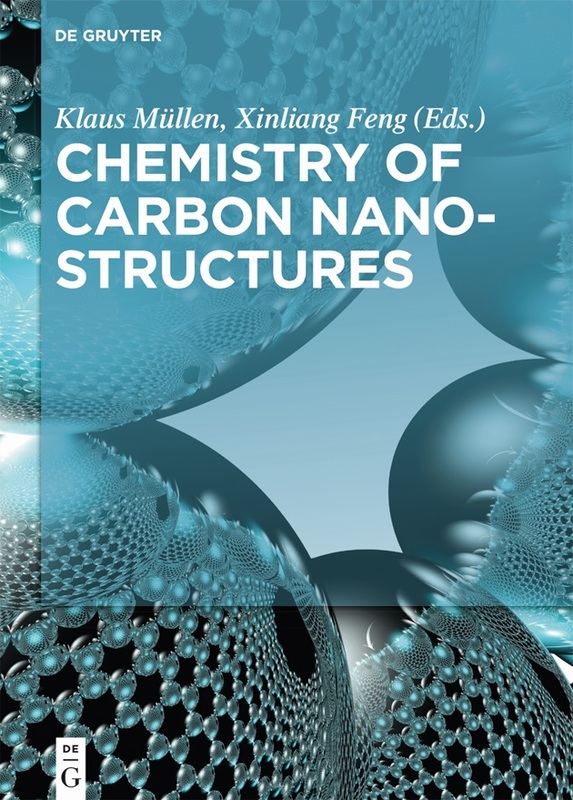 The internationally renowned experts who contributed to this book discuss chemical aspects of carbon structures, their synthesis, functionalization and design strategies for defined applications. To date, it remains a great challenge to develop the p-extended anti-aromatic polycyclic hydrocarbons (PHs) with more than 20 p-electrons. Moreover, the anti-aromatic PHs reported till now mainly adopt a planar p-conjugated carbon skeleton. In order to pursue the synthesis of novel p-extended and stable anti-aromatic PHs, Cfaed scientists at TU Dresden and collaborators reported the solution synthesis of air-stable 24 and 28 p-electron anti-aromatic PHs (1a and 1b) by laterally extending indeno[1,2-b]fluorene and fluoreno[3,2-b]fluorene, respectively. 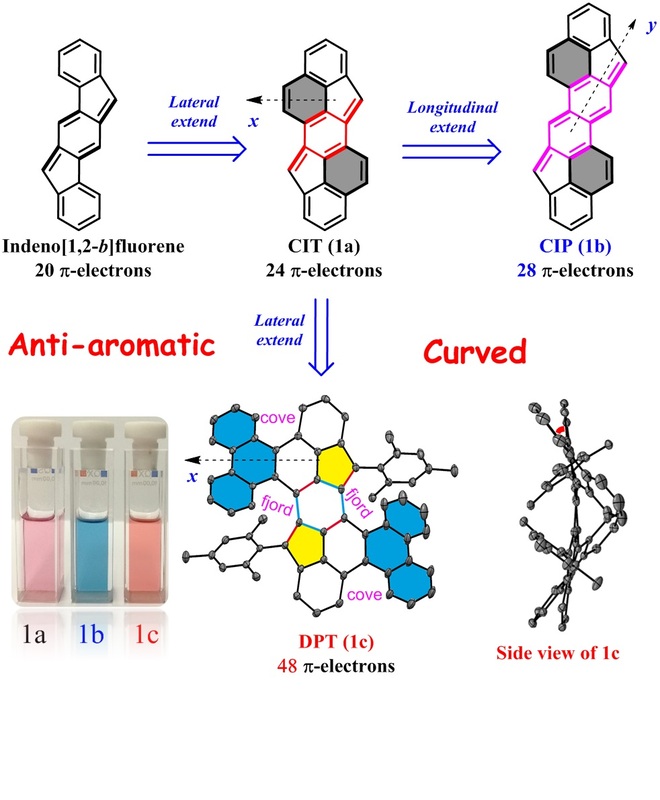 In addition, for the first time, a curved 48 p-electrons anti-aromatic molecule (1c) was synthesized. The X-ray crystallographic analysis confirms that while 1a and 1b manifest planar structures, 1c shows a curved p-conjugated carbon skeleton. The experimental results demonstrated that 1a, 1b and 1c represent a new type of air-stable, fully conjugated anti-aromatic PHs, which can be used as potential candidates in optoelectronic devices due to their narrow HOMO-LUMO energy gaps and excellent reversible electron transfer properties. The synthetic strategy towards anti-aromatic PHs by building five-membered rings from the ortho-substituted benzene units and the combination of cove-edge structures, can be applied to the construction of other air-stable p-expanded and curved anti-aromatic PHs as well as even helical graphene nanoribbons. The related works are published in J. Am. Chem. Soc. This work was financially supported by ERC grants on 2DMATER, the EC under Graphene Flagship (No. CNECT-ICT-604391), Center for Advancing Electronics Dresden (cfaed), European Social Fund and the Federal State of Saxony (ESF-Project “GRAPHD”, TU Dresden) and ERC Consolidator grant 648295 "GraM3". In May 2017 the European Research Council ERC awarded Proof of Concept Grants, each worth 150,000 €, to fifty one people - Prof. Dr. Xinliang Feng is one of the grant holders. The Proof of Concept grants can be used, for example, to establish intellectual property rights, investigate business opportunities or conduct technical validation. Growing concern about the energy crisis and the seriousness of environmental contamination urgently demand the development of renewable energy sources as feasible alternatives to diminishing fossil fuels. Owing to its high energy density and environmentally friendly characteristics, molecular hydrogen is an attractive and promising energy carrier to meet future global energy demands. In many of the approaches for hydrogen production, the electrocatalytic hydrogen evolution reaction (HER) from water splitting is the most economical and effective route for the future hydrogen economy. To accelerate the sluggish HER kinetics, particularly in alkaline electrolytes, highly active and durable electrocatalysts are essential to lower the kinetic HER overpotential. As a benchmark HER electrocatalyst with a zero HER overpotential, the precious metal platinum (Pt) plays a dominant role in present H2-production technologies, such as water-alkali electrolysers. Unfortunately, the scarcity and high cost of Pt seriously impede its large-scale applications in electrocatalytic HERs. Efficient hydrogen production on MoNi4 electrocatalysts with fast water dissociation kinetics. J. Zhang, T. Wang, P. Liu, Z. Liao, S. Liu, X. Zhuang, M. Chen, E. Zschech, X. Feng* Nat. Commun. This work was financially supported by the ERC Grant on 2DMATER and EC under Graphene Flagship (No. CNECT-ICT-604391). The Small Young Innovator Award recognizes outstanding, interdisciplinary scientific work in the development and fundamental understanding of nanoscience and nanotechnology by a young scientist or engineer. Prof. Feng is one of the two winners of the Small Young Innovator Award, receiving it for his important contributions to 2D nanomaterials. The award ceremony took place during the "Small Science Symposium" in Hong Kong at the Hong Kong Polytechnic University on May 16, 2017. Global progress in graphene research is expected to unlock a new era in the next generation of electronics. To bridge the gap between laboratory-scale study and commercial applications, mass production of high quality graphene is essential. Here Cfaed scientists at TU Dresden and collaborators demonstrate a scalable exfoliation strategy towards the production of graphene sheets that has excellent yield (ca. 75 %, 1-3 layers), low defect density (a C/O ratio of 21.2), great solution-processability and outstanding electronic property (a hole mobility of 430 cm2•V-1•s-1). By applying alternating currents, dual exfoliation at both graphite electrodes enables a high production rate exceeding 20 g h-1 in laboratory tests. As a cathode material for lithium storage, graphene-wrapped LiFePO4 particles deliver a high capacity of 167 mAh g-1 at 1 C rate after 500 cycles. The high-quality solution-processable exfoliated graphene holds great promise for a wide spectrum of applications, such as inkjet printing, solar cells and composites. This work was financially supported by ERC grants on 2DMATER and UPGreen, the EC under Graphene Flagship (No. CNECT-ICT-604391). The International Union of Pure and Applied Chemistry and Solvay announced the winners of the 2017 IUPAC-Solvay International Award for Young Chemists, presented for the best Ph.D. theses in the chemical sciences, as described in 1000-word essays. Dr. Junzhi Liu is one of the recipients of the Honorable Mention for the 2017 IUPAC-Solvay International Award for Young Chemists, which acknowledges the best PhD thesis in chemical science. We are pleased to reveal that the 'Graphene 2018' will take place in Dresden! demonstrates the remarkable energy storage potential of coordination polymer frameworks. level at the G point as well as close to the Brillouin zone boundary at X, namely k = (0.4, 0.0, 0.0). Open-shell nanographenes (or polycyclic hydrocarbons) have attracted a great deal of interest because of their unique nonlinear optical, electronic and magnetic properties, making them promising candidates for organic electronic and spintronic devices. However, it is the intrinsic instability of the biradical species that limits the practicality of this research. 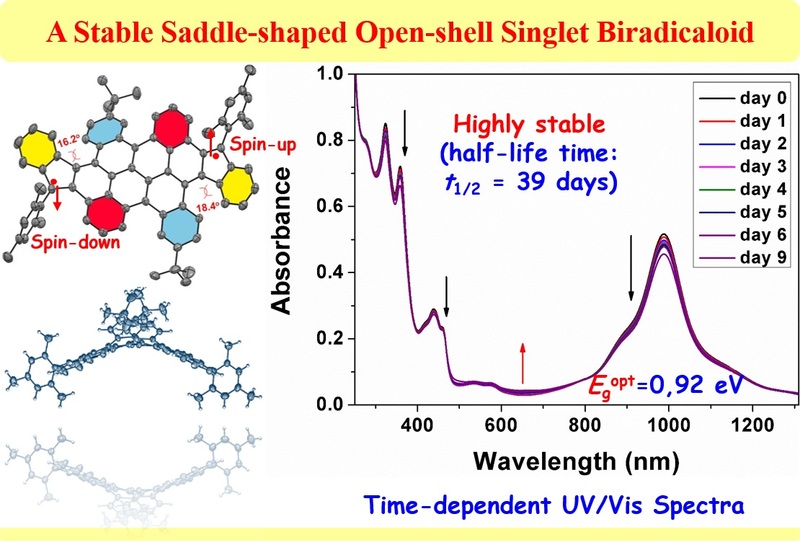 The scientists from Dresden University of Technology (Prof. Xinliang Feng) reported the synthesis of the first example of highly stable open-shell nanographenes with a saddle-shaped p-conjugated geometry. The achieved saddle-shaped nanographenes exhibits an open-shell singlet biradical structure (biradical index: y = 0.69) in the ground state with a narrow optical energy gap of 0.92 eV. More importantly, the title nanographene displays excellent stability at air and sun light conditions, with the half-life time (t1/2) as long as 39 days. The synthetic concept reported in this work introduces new perspectives on the accessibility of high-spin graphene-like moleculae with a view towards potential materials applications in organic spintronics. The related works are published in Angewandte Chemie, for more details please click the link: http://dx.doi.org/10.1002/anie.201611689. This work was financially supported by ERC grants on 2DMATER, the EC under Graphene Flagship (No. CNECT-ICT-604391), Center for Advancing Electronics Dresden (cfaed), European Social Fund and the Federal State of Saxony (ESF-Project “GRAPHD”, TU Dresden). Literature: Ji Ma, Junzhi Liu*, Martin Baumgarten, Yubin Fu, Yuan-Zhi Tan, Karl Sebastian Schellhammer, Frank Ortmann, Gianaurelio Cuniberti, Hartmut Komber, Reinhard Berger, Klaus Müllen and Xinliang Feng*. Angew. Chem. Int. Ed. 2017, 56, DOI: 10.1002/anie.201611689. Currently, fully sulfur-substituted polycyclic aromatic hydrocarbons (PAHs) carrying fused disulfide bonds at the periphery have not yet been achieved. Here, Cfaed scientists at TU Dresden with collaborators report the first synthesis of a persulfurated PAH as a next-generation “sulflower.” In this novel PAH, disulfide units establish an all-sulfur periphery around a coronene core (C24S12). The structure, electronic properties, and redox behavior were investigated by microscopic, spectroscopic and electrochemical methods and supported by density functional theory (DFT). The sulfur-rich character of persulfurated coronene renders it a promising cathode material for lithium-sulfur batteries, displaying a high capacity of 520 mAh g-1 after 120 cycles at 0.6 C with a high-capacity retention of 90%. The protocol established in this work offers unique access to larger PAHs and graphene (or graphene nanoribbons) with persulfurated edges and paves the way toward promising applications in OFETs, OPVs, energy, and superconductor-related areas. Smart micro-/nano-devices or stimuli-responsive devices have attracted substantial attention due to a wide range of needs for smart modern electronics. Nevertheless, it remains a great challenge to integrate various kinds of stimuli into modern functional devices without sacrificing the device performance, most probably due to the poor compatibility among those stimuli, active materials, and processing technologies. The scientists from Dresden University of Technology (Prof. Xinliang Feng) and Chemnitz University of Technology (Prof. Oliver G. Schmidt) reported the fabrication of the first stimulus-responsive micro-supercapacitor (SR-MSC) with ultrahigh volumetric energy density (20 mWh cm-3 at 235 W cm-3) and reversible electrochromic effect by employing vanadium pentoxide and electrochemical exfoliated graphene-based hybrid nanopaper and viologen as electrode and stimulus-responsive material, respectively. The fabricated high performance SR-MSCs offer new opportunities for intuitively observing the working state of energy devices without the aid of extra equipment and techniques. 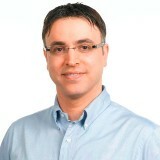 This work was financially supported by the German Research Foundation (DFG) within the Cluster of Excellence “Center for Advancing Electronics Dresden” (cfaed) and the Initiative and Networking Fund of the German Helmholtz Association, Helmholtz International Research School for Nanoelectronic Networks NanoNet (VH-KO-606), ERC Grant on 2DMATER, UP-GREEN, and EU Graphene Flagship. Literature:  Panpan Zhang, Feng Zhu, Faxing Wang, Jinhui Wang, Renhao Dong, Xiaodong Zhuang,* Oliver G. Schmidt, and Xinliang Feng*, Stimulus-Responsive Micro-Supercapacitors with Ultrahigh Energy Density and Reversible Electrochromic Window, Adv. Mater. 2017, in press. [DOI: 10.1002/adma.201604491]. Two-dimensional (2D) soft materials have attracted increasing attention in chemistry, materials science, nanotechnology and biology due to their fascinating optical, electrical, mechanical and magnetic properties derived from the reduction of dimensions. One of the key challenges in 2D materials is to go beyond graphene, a prototype 2D polymer (2DP), and to synthesize its organic analogues with structural control at the atomic- or molecular-level. 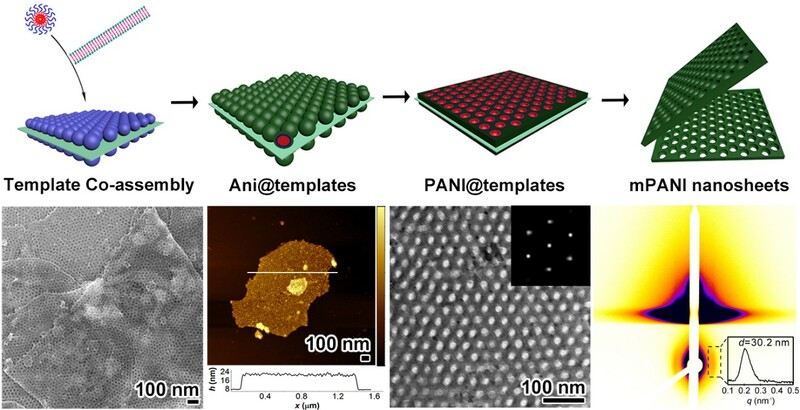 Here, Cfaed scientists at TU Dresden, reported the successful preparation of porphyrin containing monolayer and multilayer crystalline conjugated 2DPs through the Schiff-base polycondensation reaction at an air-water and liquid-liquid interface. The monolayer 2DP has a thickness of 0.7 nm with a lateral size of 4-inch wafer, and has a Young’s modulus of 267±30 GPa, which is on the same order of graphene (200-1000 GPa). The 2DP has an optical band gap of 1.4 eV and the monolayer 2DP can function as an active semiconducting layer in a thin film transistor and electrocatalyst towards water splitting. 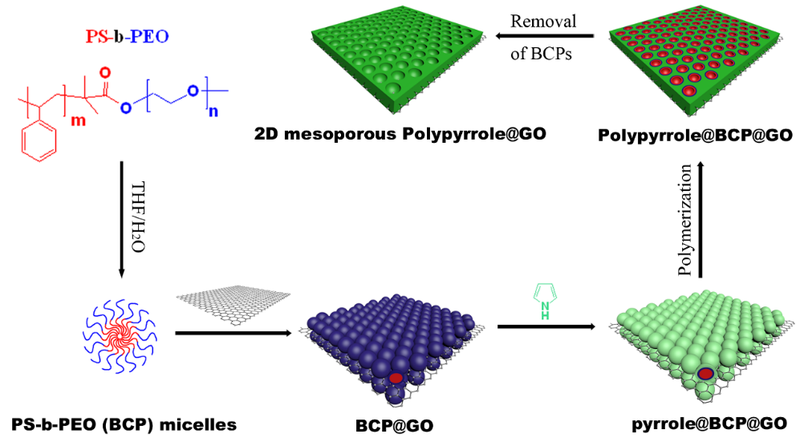 This work opens the door for the synthesis of functional 2DPs using reversible polycondensation reaction, which may pave the way for the rational synthesis of 2D organic soft materials for next generation electronics and energy-related applications. 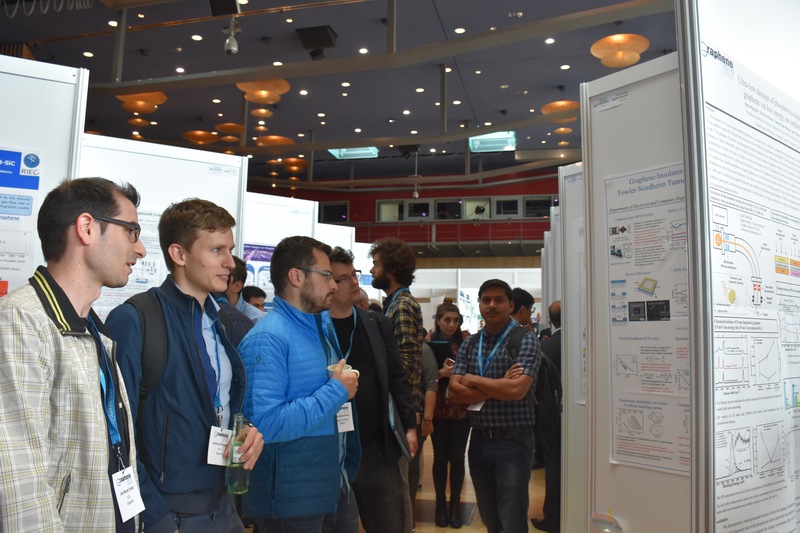 On November 3rd and 4th a meeting of the EU Graphene Flagship with 31 participants from 18 different European institutes and companies took place at TU Dresden. The purpose of the meeting of the Flagship Work Package 13 on Functional Foams and Coatings led by Professor Xinliang Feng was to discuss recent progress and future perspectives in the field of graphene and related 2D materials. The special focus was their use in coatings, thin films and porous structures like foams and membranes for applications such as energy storage and conversion, catalysis, water remediation and environmental protection. Sheets of carbon an atom thick could soon double the amount of electricity stored in smartphone batteries, researchers believe, as 2D materials present a picture of the future of energy storage. The transition from fossil fuels to renewable energy, combined with the increasing power of today’s portable devices, calls for cheap materials that can store electricity on an unprecedented scale. Researchers are exploring the extraordinary characteristics of two-dimensional nanomaterials to achieve this goal. According to Professor Xinliang Feng, at the Technical University Dresden, Germany, confining the thickness of materials to nanoscopic dimensions can endow them with exciting physical and chemical properties. This is because, at small scales, electrons obey the exotic laws of quantum mechanics. They spread like waves, exist in multiple places at the same time, and engage in all manner of activities that contradict our experience in the macroscopic world. Prof. Feng is trying to put quantum effects to work in cheaper and more powerful energy storage technologies. Already atomically thin layers of carbon, known as graphene, are helping researchers squeeze more electricity out of conventional lithium-ion batteries. The negative electrode of these batteries is commonly made of bulk carbon. Each lithium ion stores energy by fixing itself to this electrode, typically by bonding with six carbon atoms on its surface. 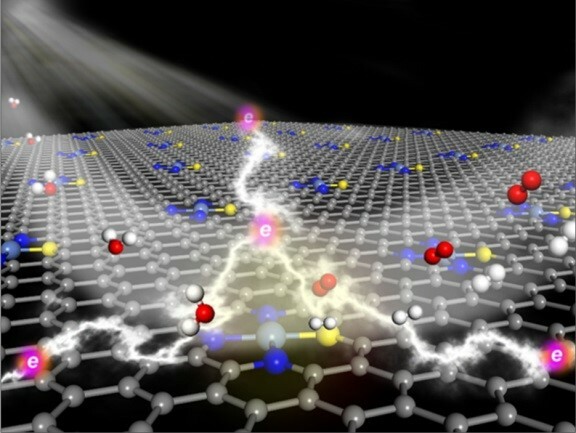 Because graphene is so thin, the lithium ions only need three carbon atoms to hold them in place. This doubles the amount of energy that can be stored in a given size of battery. On September 7th, the official start of the ESF-supported Young Researcher Group ‘Graphene Center Dresden’ (GraphD) took place at TU Dresden. 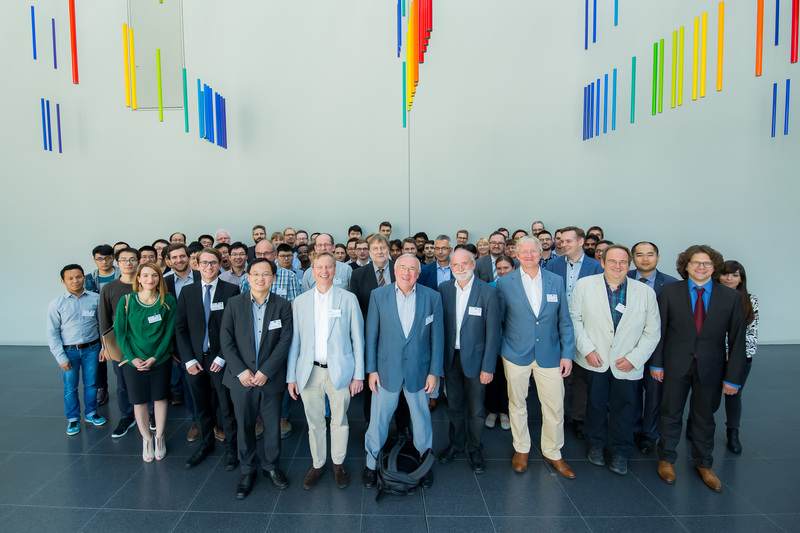 In addition, the initiation of a new path dedicated to two dimensional materials within the Cluster of Excellence Center for Advancing Electronics Dresden (cfaed) was celebrated with the participation of very distinguished guests. 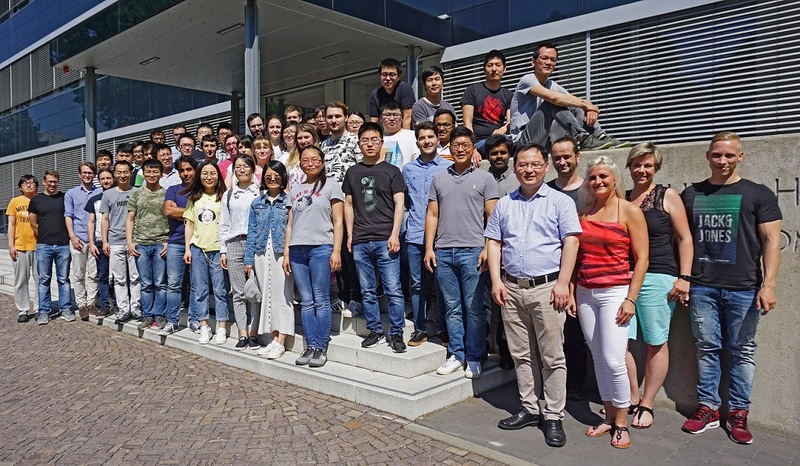 The Graphene Center Dresden is an ESF Young Researcher Group, funded by the European Social Fund (ESF), with strong collaboration of many chairs within TU Dresden under the supervision of cfaed’s Strategic Professorship ‘Molecular Functional Materials’ of Prof. Xinliang Feng. Cooperation partners include, e.g., Prof. Sibylle Gemming, Prof. Alexander Eychmüller, Prof. Stefan Kaskel, Prof. Karl Leo, Prof. Stefan Mannsfeld, Prof. Michael Schröter, Prof. Gotthard Seifert as well as Prof. Gianaurelio Cuniberti. All hold important functions within cfaed as research path leaders and principal investigators. With this joint competence, TU Dresden will emerge as one of the most important European actors in the field of the “wonder material” graphene and related two-dimensional materials. These one-atom thin materials exhibit outstanding physical properties, which render them promising candidates for application in various fields of electronic and energy applications as well as, for instance, novel lubricants. Meanwhile, graphene has been implemented in the first industrial applications. This is also one of the core competences of the Graphene Center Dresden: The close relationship to industrial partners is an elementary part of its strategy. The recently started ESF young researcher group ‘GraphD’ is an important milestone, funded by the European Social Fund (ESF). GraphD started on July 1st and consists of three postdocs, six PhD students, and the research group leader Dr. Reinhard Berger. Aims of the group are, amongst others, to attract the world’s most renowned young scientists in the field, train outstanding experts for Saxony’s industry, enforce the innovation potential of local companies, and to efficiently complement the regional cluster of ‘Silicon Saxony’. The Center for Advancing Electronics Dresden currently prepares a proposal within the ‘Excellence Strategy’ of the German Federal and State governments. It’s program will be extended to include research of two-dimensional materials within a new ‘2.5D-path’. Despite the availability of numerous two-dimensional (2D) materials with structural ordering at the atomic or molecular level, direct construction of mesoscale-ordered superstructures within a 2D monolayer remains an enormous challenge. 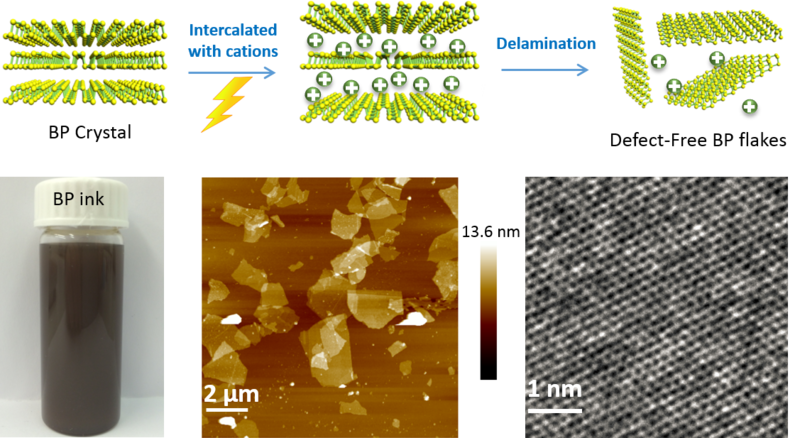 Here, cfaed scientists at TU Dresden with collaborators, report the synergic manipulation of two types of assemblies in different dimensions to achieve 2D conducting polymer nanosheets with structural ordering at the mesoscale. The resulting polyaniline nanosheets feature mesoscale-ordered hexagonal pore arrays, tunable morphologies and pore sizes, large specific surface area as well as anisotropic and record-high electrical conductivity. 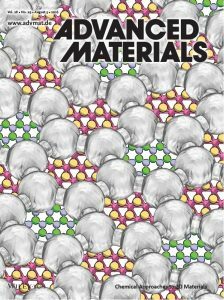 Such moldable approach creates a new family of mesoscale-ordered structures as well as opens avenues to the programmed assembly of multifunctional materials. Link to: Angewandte Chemie Int. Ed. A novel class of dibenzo-fused 1,9-diaza-9a-boraphenalenes featuring zigzag edges with a nitrogen-boron-nitrogen bonding pattern named NBN-dibenzophenalenes (NBN-DBPs) has been synthesized. Alternating nitrogen and boron atoms imparts high chemical stability to these - else very reactive -zigzag-edged polycyclic aromatic hydrocarbons (PAHs). Upon oxidation, an open-shell intermediate is formed corroborated by spectroscopic calculations and in-situ spectroelectrochemistry. The oxidized nitrogen-boron-nitrogen subunit is isoelectronic to the pristine carbon zigzag periphery but also positively charged. This new synthetic strategy represents an efficient pathway towards NBN-doped zigzag-edged graphene nanoribbons. Prof. Xinliang Feng has served as the organizer of the Graphene Flagship EU-Korea Workshop on Graphene and related 2D Materials. The workshop took place in Copenhagen, Denmark from August 15 - 16, 2016. The purpose of the EU-Korea workshop is to exchange experiences, practices and ideas related to the current and emerging topics associated with the basic chemistry approach, materials synthesis, application development and commercialisation for graphene and related 2D materials. In addition, the aim is to explore further possibilities for collaborative research opportunities between researchers in Europe and Korea. This workshop is a follow up of the first EU-Korea workshop held in Busan (Republic of Korea) in 2015. 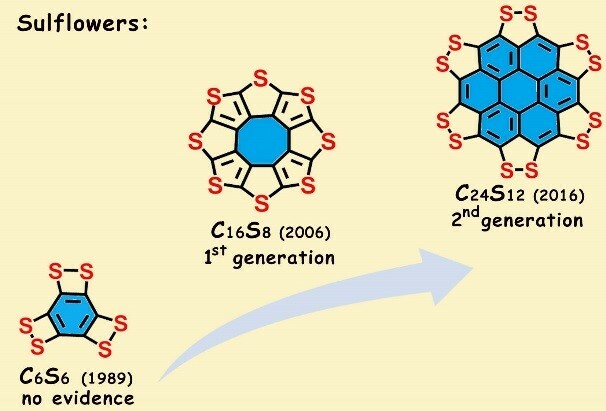 Total synthetic approaches of fullerenes are a holy grail for organic chemistry. So far, the main attempts have been focused on the synthesis of the buckminsterfullerene C60. In contrast, access to subunits of the homologue C70 remains challenging. 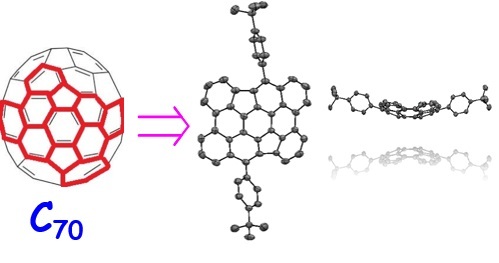 Here, we demonstrate an efficient bottom-up strategy towards a novel bowl-shaped polycyclic aromatic hydrocarbons (PAH) C34 with two pentagons. This PAH represents a subunit for C70 and also of other higher fullerenes. The bowl-shaped structure was unambiguously determined by X-ray crystallography. Especially, a bowl-to-bowl inversion for a C70 fragment in solution was investigated by dynamic NMR analysis, showing a bowl-to-bowl inversion energy (ΔG‡) of 16.7 kcal mol-1, which is further corroborated by DFT calculations. On Monday, April 25, 2016 Prof. Xinliang Feng (cfaed / Chair for Molecular Functional Materials) welcomed a delegation of 20 people from the Chinese Graphene Industrial Alliance (CGIA) in Dresden. A workshop on graphene and nanoscience was organized including the top scientific and industrial experts from TU Dresden, Leibniz Institute for Polymer Research Dresden (Leibnitz-IPF), and Chinese representatives from industry and science. TUD’s vice-rector for research Prof. Gerhard Rödel held the welcoming speech and introduced the university to the guests from China. During the workshop, Prof. Karl Leo (Chair for Optoelectronics) represented the Center for Advancing Electronics Dresden (cfaed) and Institute for Applied Photophysics (IAPP) and Dr. Martin Lohe (Chair for Molecular Functional Materials) informed about the latest developments in graphene production. The delegation of the CGIA informed about their activities in regards to graphene commercialization. Since China has emerged to be a key player not only in terms of industrial aspects but also regarding the outstanding scientific development, the purpose of the workshop was to lay the foundations for the future cooperation between TU Dresden and China. When electrons spin differently Graphene nanoribbons: it's all about the edges. As reported by the journal Nature in its latest issue, researchers from Empa, the Max Planck Institute in Mainz and the Technical University of Dresden have for the first time succeeded in producing graphene nanoribbons with perfect zigzag edges from molecules. Electrons on these zigzag edges exhibit different (and coupled) rotational directions ("spin"). This could make graphene nanoribbons the material of choice for electronics of the future, so-called spintronics. Graphene, a modified form of carbon, offers versatile potential for use in coating machine components and in the field of electronic switches. An international team of researchers led by physicists at the University of Basel, and including TU Dresden (Dr. Andrea Benassi and Dr. Xinliang Feng) have been studying the lubricity of this material on the nanometer scale. Since it produces almost no friction at all, it could drastically reduce energy loss in machines when used as a coating, as the researchers report in the journal Science. In future, graphene could be used as an extremely thin coating, resulting in almost zero energy loss between mechanical parts. This is based on the exceptionally high lubricity—or so-called superlubricity—of modified carbon in the form of graphene. Applying this property to mechanical and electromechanical devices would not only improve energy efficiency but also considerably extend the service life of the equipment. Fathoming out the causes of the lubricant behavior An international community of physicists have studied the above-average lubricity of graphene using a two-pronged approach combining experimentation and computation. To do this, they anchored two-dimensional strips of carbon atoms—so-called graphene nanoribbons—to a sharp tip and dragged them across a gold surface. Computer-based calculations were used to investigate the interactions between the surfaces as they moved across one another. Using this approach, the research team is hoping to fathom out the causes of superlubricity; until now, little research has been carried out in this area. By studying the graphene nanoribbons, the researchers hope to learn about more than just the slip behavior. Measuring the mechanical properties of the carbon-based material also makes sense because it offers excellent potential for a whole range of applications in the field of coatings and micromechanical switches. In future, even electronic switches could be replaced by nanomechanical switches, which would use less energy for switching on and off than conventional transistors. The experiments revealed almost perfect, frictionless movement. It is possible to move graphene nanoribbons with a length of 5 to 50 nanometers using extremely small forces (2 to 200 piconewtons). There is a high degree of consistency between the experimental observations and the computer simulation. A discrepancy between the model and reality appears only at greater distances (five nanometers or more) between the measuring tip and the gold surface. This is probably because the edges of the graphene nanoribbons are saturated with hydrogen, which was not accounted for in the simulations. "Our results help us to better understand the manipulation of chemicals at the nano level and pave the way for creating frictionless coatings," write the researchers. The ability to pattern functional moieties with well-defined architectures is highly important in material science, nanotechnology and bioengineering. Although two-dimensional surfaces can serve as attractive platforms, direct patterning them in solution with regular arrays remains a major challenge. Here, cfaed scientists at TU Dresden with collaborators, developed a versatile route to pattern two-dimensional free-standing surfaces in a controlled manner assisted by monomicelle close-packing assembly of block copolymers, which is unambiguously revealed by direct visual observation. This strategy allows for bottom-up synthesis of two-dimensional mesoporous conducting polymer nanosheets with adjustable mesopores on various functional free-standing surfaces, including two-dimensional graphene, molybdenum sulfide, titania nanosheets, and even on one-dimensional carbon nanotubes. This approach will shed light on developing solution-based soft patterning of given interfaces towards bespoke functions. Two scientists of TU Dresden succeeded in the second call for proposals of the European Research Council, “Proof of Concept Grants”. 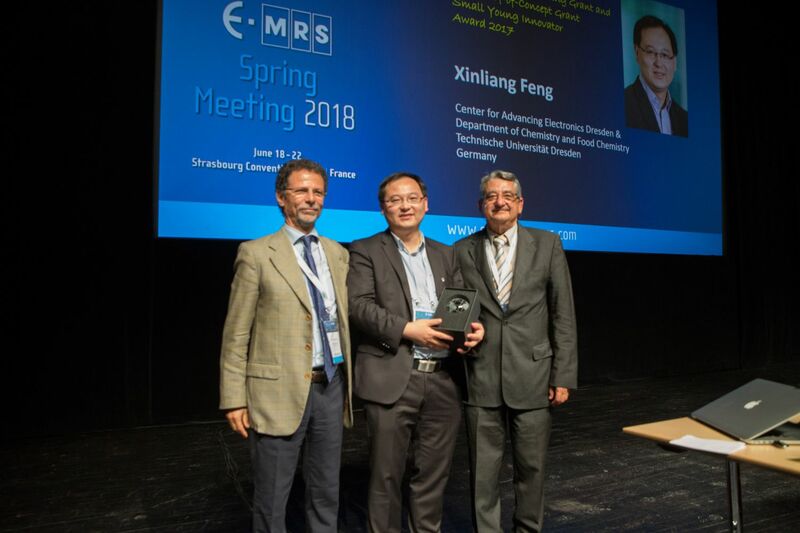 One of them is cfaed's Strategic Professor Xinliang Feng who has been honored for his project concerning electrochemical delamination of graphite. The honored scientists will now receive a sponsorship up to 150.000 Euros, which will contain a study about the viability of commercial utilization of the excellent research results. To apply for the sponsorship it was required that the scientists and projects had already been promoted by ERC. With the 'Proof of Concept Grant' the ERC wants to make a contribution to growth and innovation in the European Union. 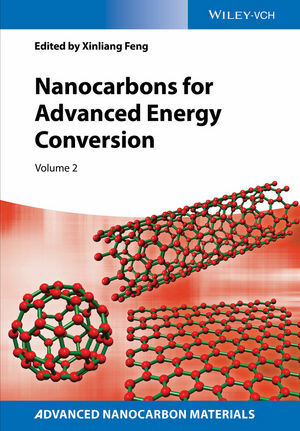 Wiley has published the book "Nanocarbons for Advanced Energy Conversion" which has been edited by Prof. Xinliang Feng. The book is the volume 2 of the book series on nanocarbons for advanced applications. Despite the intensive research efforts devoted to graphene fabrication over the last decade, the production of high-quality graphene on a large scale, at an affordable cost and in a reproducible manner still represents a great challenge. 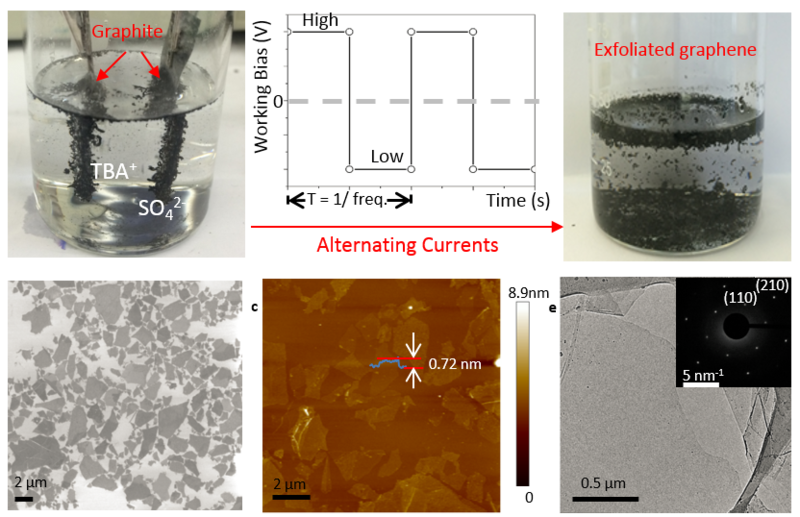 Cfaed scientists with collaborators report a novel method based on the controlled electrochemical exfoliation of graphite in aqueous ammonium sulfate electrolyte to produce graphene in large quantities and with outstanding quality. The developed exfoliation method results in large graphene sheets (5-10 µm on average), which exhibit outstanding hole mobilities (~405 cm2 V-1 s-1), very low Raman ID/IG ratios (below 0.1), and extremely high carbon to oxygen (C/O) ratios (~25.3). Moreover, the graphene ink prepared in dimethylformamide qualifies this material for intriguing applications such as transparent conductive films and flexible supercapacitors. In general, this robust method for electrochemical exfoliation of graphite offers great promise for the preparation of graphene that can be utilized in industrial applications to create integrated nanocomposites, conductive or mechanical additives as well as energy storage and conversion devices. Prof. Dr. Xinliang Feng was listed as highly cited researcher in 2015 (published by Thompson Reuters) for both categories - chemistry and materials science. cfaed scientists at TU Dresden with collaborators demonstrate a novel type of “rod−coil” graft copolymer containing a polyphenylene backbone linked with poly(ethylene oxide) (PEO) side chains. Such graft copolymers manifest unprecedented temperature-dependent one-dimensional (1D) and two-dimensional (2D) self-assembly in solution. 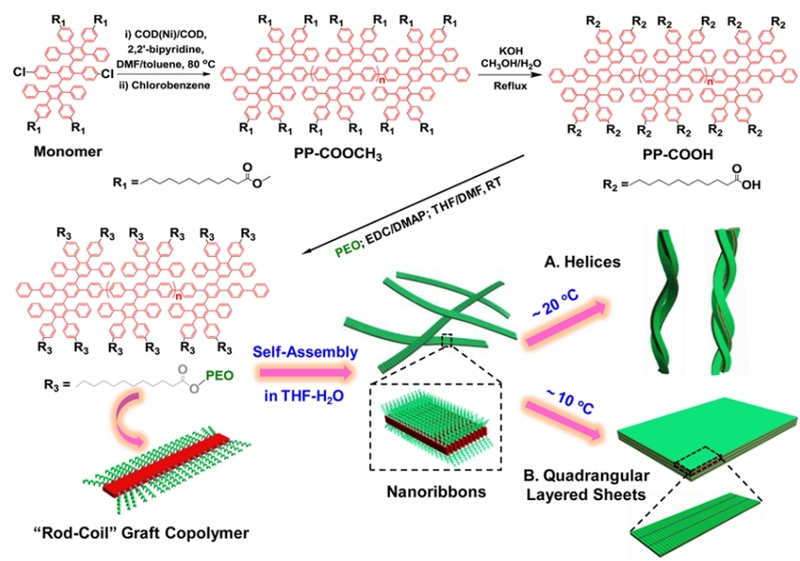 At 20°C, which is higher than the crystallization temperature (Tc) of the PEO chains, the achiral graft copolymers self-organize into nanoribbons that twist into 30 μm ultralong helices with controlled pitch depending on the grafting ratio of the PEO chains. At 10°C, which is lower than the Tc, quadrangular multilayer sheets of over 10 μm in lateral size are obtained. This work presents the first example of controlled self-assembly of graft polymers into 1D helix and 2D sheet superstructures. Such graft polymers provide new opportunities for the controlled preparation of 1D helix and 2D superstructures as well as offer a new system for the fundamental studies on the self-assembly of conjugated polymers, including morphological control, thermodynamics and kinetics, potential applications, etc. Two-dimensional polymers and supramolecular polymers refer to laterally infinite, one monomer-unit thick, free-standing network with a defined internal periodicity based on covalent and non-covalent bond, respectively. They represent a new class of artificially created 2D materials with a manifold of promises in electronics, membrane technology, catalysis, sensing, and energy storage and conversion. 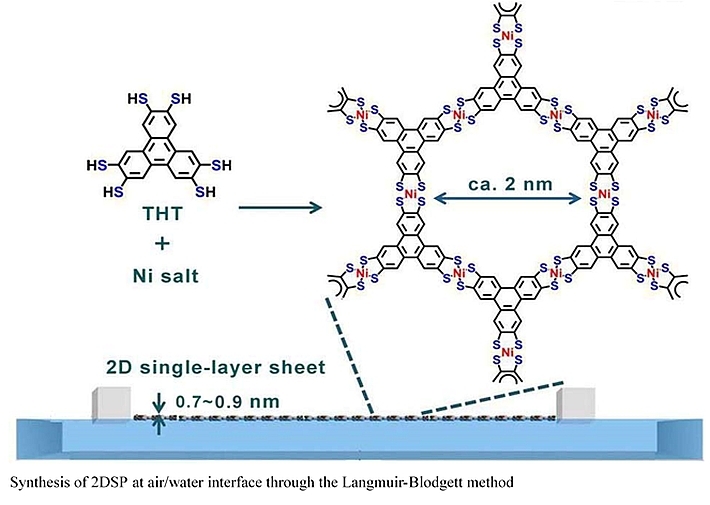 Here, cfaed scientists at TU Dresden, reported the synthesis of a large-area (mm2) crystalline 2DSP with a thickness of ∼ 0.7 nm, comprising triphenylene-fused nickel bis(dithiolene) complexes, at an air/water interface of Langmuir-Blodgett trough under ambient conditions. Such 2DSP, processed on a glassy carbon electrode, exhibited excellent electrocatalytic activity for hydrogen evolution reaction from water with a Tafel slope of 80.5 mV decade-1 and an operating overpotential of 333 mV at 10 mA cm-2, which are superior to those of carbon nanotube (CNT)-supported molecular catalysts and heteroatom-doped graphene catalysts. This work opens the door for developing large-area, free-standing 2D organic materials consisting of immobilized molecular catalysis as novel electrode materials bearing functions in energy technologies. On Wednesday, 15 July 2015, 15:00 - 17:00 we will hold a Minisymposium on Graphene Materials. Beginning at 3 p.m. Prof Hui-Ming Cheng (Chinese Academy of Sciences) is going to give a talk titled “Graphene Materials: Large-Scale Fabrication and Application Explorations”. Beginning at 4 p.m., Prof. Shi-Zhang Qiao (University of Adelaide, Australia) is going to give a talk titled “Metal-free and Non-precious Metal Materials for Energy-relevant Electrocatalytic Processes”. 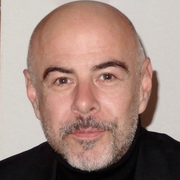 We are happy to welcome Prof. Maurizio Prato (Università degli Studi di Trieste, Italy) on 13 July 2015 for a talk at our chair! 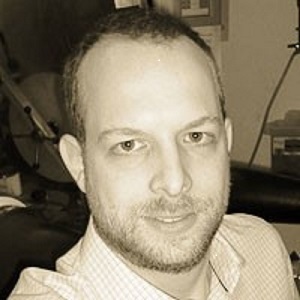 Prof. Prato will speak about "Synergies between chemistry and nanotechnology: applications to neurosciences and energy". 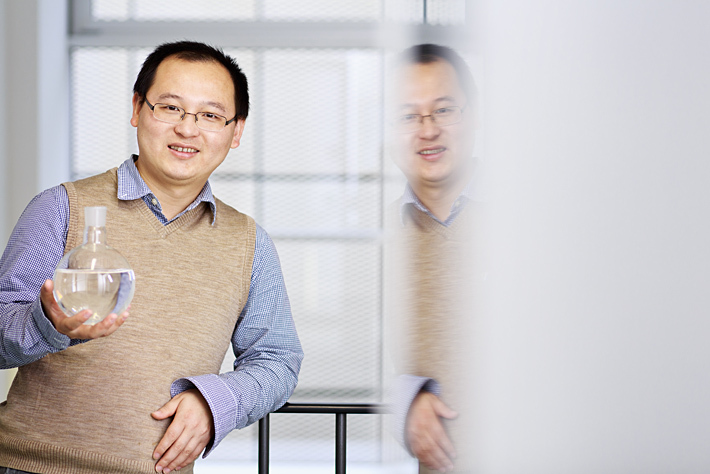 In November 2014, Prof. Dr. Xinliang Feng has been appointed a Fellow of the Royal Society of Chemistry, UK. The honor is given to researchers who have made outstanding contributions to the advancement of chemical science. The Royal Society of Chemistry has more than 49,000 members worldwide. The largest chemical society in Europe, the organization works to promote the development, practice and application of the chemical sciences across the world. In particular, the society encourages the participation of students and young people in chemistry. New Certificate: "Highly Cited Researcher"
Prof. Xinliang Feng appears in the 2014 “highly cited researcher” list published by Thompson Reuters. This prestigious list includes scientific researchers whose publications have been cited most often in academic journals over the past decade and rank among the top 1 % most cited for their subject field and year of publication. Those listed are identified as being among the world’s leading scientific minds, along with the universities and institutions which employ them.